Whether you are a medical professional, first responder, firefighter, or law enforcement, you can absolutely benefit from the Rico Response App, available on the Apple App Store and Play Store. The app is a way to communicate directly to a Rico team member from the moment you need a flight dispatched until arrival at your location. Once, activated for assistance, the Rico team is sent your location. In addition, the app has a neat tracking feature, so you know how long exactly until help arrives! We can also geolocate your position for more accurate scene identification and efficiency. The app’s main purpose is to sponsor smooth and effortless patient transport. Once the patient’s current medical team decides that it is in the patient’s best interest to transfer to another location, the one-touch dispatch system alerts a Rico team member, and the transferring medical professional or first responder is contacted by Air Comm. Once dispatched, the flight can be followed by the app tracking feature and a picture of the team is shown to the transferring caregiver for recognition upon pick-up from the scene or hospital. Before the team is dispatched to the patient’s location, the airplane and helicopter are prepped and the team contacted. With the app, the patient transfer process and scene response are not only quicker but also more efficient. 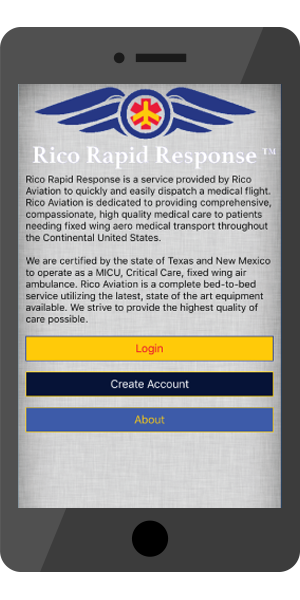 The next time someone you care about needs air transport, utilize the Rico Rapid Response system! Let us know how we are doing by utilizing the survey after the call directly from the app. You will also get a follow-up phone call to let you know how the patient did during transport. Rico is certified by Texas, New Mexico, and Colorado to provide transferring patients with state of the art care mid-transport. Dispatch Rico 24 hours all day, every day with the Rico Rapid Response App.